The principle of anodising aluminium developed out of aluminiums ability to form an oxide layer, which can be electro-chemically produced under controlled conditions to provide thick and protective finishes. In essence the process consist of passing an electric current through an acid solution in which the immersed aluminium component acts as an anode and aluminium, titanium or lead acts as a cathode. During the process electrolysis breaks down the water into oxygen and hydrogen. The oxygen combines with aluminium to produce aluminium oxide and the hydrogen is released. The aluminium component is loaded onto an appropriate jig or racking system. The jig allows the electric current to pass through the aluminium component. The jig also enables the component to be handled throughout the process. The appearance of the aluminium surface will depend on the type of alloys used. Some aluminium alloys are more suitable for decorative anodising than others. 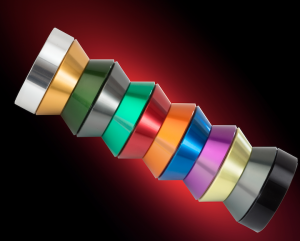 During the anodising process various colours can be imparted on the aluminium component to give you a desired finish. Hard anodising refers to a number of low temperature processes that produce films of oxide that are dense and thick typically 50-100 microns. They have better abrasion resistance than the best treated steels and their electrical insulation properties are on a par with those of porcelain. Hard anodising is used in the electrical and mechanical industries. The coefficient of friction is reduced by a number of impregnation products: lanolin, Teflon, molybdenum sulphide etc. given the thickness of the films it may be necessary in some cases to allow for dimensional variations after anodising.